Do you guys remember The Perks of Being a Wallflower? I’ve never read it, but as a teen growing up in the late 90s and 2000s, I can clearly recall how the book resonated with a lot of my high school peers. Well, twenty years later, the author’s second novel is apparently a literary horror about a boy and his creepy imaginary friend. I have no idea how this one’s going to turn out, but the story description sounds crazy intense and I am curious. “Christopher is seven years old. Christopher is the new kid in town. Christopher has an imaginary friend. The epic work of literary horror from the #1 bestselling author of THE PERKS OF BEING A WALLFLOWER. Single mother Kate Reese is on the run. Determined to improve life for her and her son, she flees an abusive relationship in the middle of the night with Christopher at her side. Together, they find themselves drawn to the tight-knit community of Mill Grove, Pennsylvania. It’s as far off the beaten track as they can get. Just one highway in, one highway out. Oooh that sounds creepy good! I’m going to have to keep an eye on this one! So this sounds great and I’ve not seen it before. It’s definitely going on the wishlist. However, my head is having a hard time reconciling that this author did both books. Okay, just went to add it at Goodreads. This book is 780 pages long! Looks like he’s taking a page out of King for his horror debut! Me neither, I’ve never read Perks either, but it just seems very different! And yes, I am getting King vibes too, even off the cover design! I’m not sure what to think about this! It’s always jarring when an uber popular writer switches genres so dramatically. This is one I’ll keep an eye on, though! Yeah, it’s a huge switch! Though it’s been 20 years between books, maybe he just felt like writing a horror? LOL! Oh hell Mogsy! A boy and his creepy imaginary friend? Brrrr. Oh this one is definitely inriguing! It does, doesn’t it? Something about this is screaming King to me as well. And the cover design seems to be trying to sell that idea as well. I love the sound of this one. 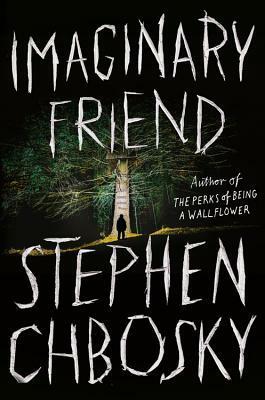 I didn’t read The Perks so I’d definitely like to give this one a go and it releases during ‘creepy’ season which is perfect. Never read Perks either, and honestly it doesn’t interest me. This one does, though! Wooow. I shy away from stories with kids in peril, but I don’t think I can pass up a literary horror. It sounds really good! I find it hard to pass up that synopsis too! This one certainly sounds creepy!